From Wu-Tang Clan ("C.R.E.A.M") to JLo ("Dinero") to Cardi B ("Money"), we can't escape talking (and wanting!) money and financial abundance. Yet, living a financially abundant life is more than making money - it's also getting clear about the experiences that shape our money habits and beliefs. Many of these are formed in childhood and were informed by what our parents and other adults modeled for us (sociedad, susu, 401Ks, etc). While many of us inherited great financial habits, some of us also experienced financial trauma (i.e. poverty, financial control, bankruptcy), which typically has long-lasting effects as well. learn tangible tools and mindset hacks to improve habits, meet financial goals and lead abundant lives. Light appetizers + Wine - to set the perfect the mood for a Girls Night Out! This panel discussion, educational and inspirational in nature, will help participants learn about the intersection of mental health, masculinity, and culture. Panelists will share their experiences with emotional well-being, challenges due to culture and/or societal expectations, as well as resources that have been helpful. Though the event is centered around the experiences of men, the event is open to all folks who would like to support the health of a loved one. Limited seating. Please grab your free tix here. This 90-min workshop will teach you everything you need to know about boundaries so that you can step into 2019 in all of your glory! Click on the image to get your tix! Join us for a 3-part mind-body experience designed to help you release what no longer serves you, create space for new blessings, and sustain you throughout change. Followed by an intentional, specially-sequenced and thematic yoga flow, we'll dive deeper into understanding what blocks us, what those blocks teach us, and how to release them to make space for the life we want to manifest. We'll also create a container to hold each other as we walk towards and through change. Yinsa is a wellness lifestyle founded on the premise that preservation of the body and soul is the key to a joyful life. Balance, self-care, patience, practice and wellness make up the core principles of Yinsa. 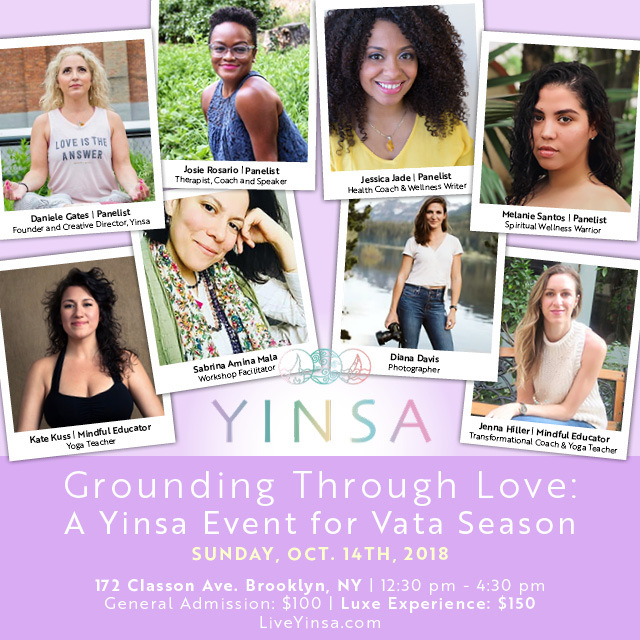 This event will include a panel presentation and creative workshop with a visualization meditation, a grounding yoga practice, a panel discussion including members from all over the wellness community (including yours truly! ), and a luxe VIP experience, where VIP guests will create flower crowns and mala jewelry, and enjoy a branded photo experience and shop with local vendors. Join me as I lead a yoga class that is affirming, welcoming and fun! Click on the image or here to grab your tickets today! We live in a society that stigmatizes mental health. Most individuals do not fully understand what it is nor how it impacts everyone around us, from children to our grandparents. Therapy is an excellent and research-backed tool to explore your emotional well-being and help you lead the life you desire. Contrary to popular belief, having a therapist doesn't mean that you're "crazy" or that something is wrong with you. On the contrary, therapy empowers you to leverage your courage, vulnerability, and strength to live your life on your terms. This workshop will cover the basics of mental health, therapy and how to find a therapist that works for you. In addition, we will demystify common myths around therapy and discuss some of the challenges and barriers that may arise. You will leave this workshop with the knowledge, tools, and inspiration to go as hard for your emotional health as you would for anything worthwhile in your life. Come with questions as we will have a dedicated Q&A portion during the virtual workshop! Click on the image or here to grab your tickets today!